Sweet and salty flavors star in this comforting side dish. Coat a baking pan with cooking spray. Spread the butternut squash in a single layer and coat the tops with cooking spray. Bake for 20-25 minutes, or until fork tender; cool to room temperature. In a blender, pulse oats into a fine flour. Add the milk, salt and eggs. Blend until smooth. In a small nonstick pan, coated with cooking spray, over medium heat. Evenly coat the pan with 1/4 cup of egg mixture, and cook until the sides begin to look dry. Carefully flip the crepe over and cook 45 seconds more. Remove from pan and place on a cooling rack. Repeat with the remaining egg mixture. In a medium bowl, combine the squash, goat cheese and sage. Coat an 8x8-inch baking dish with cooking spray. 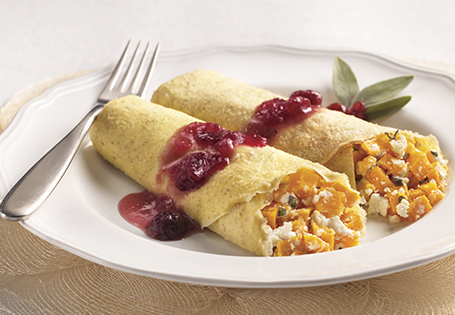 Fill each crepe with 2 heaping tablespoons of filling. Fold “burrito” style and place in the prepared dish. Bake for 5 minutes, or until cheese has begun to melt. In a small saucepan, combine the cranberry sauce, applesauce and chicken broth; simmer for 5 minutes. In a small bowl, combine the corn starch and 1 tablespoon of water. Stir into the sauce mixture and simmer for 5 minutes more. To serve, plate the crepe and spoon sauce over the top.